The cake’s intricate and delicate pattern was based on the bride’s wedding dress (I would love to see the dress!) 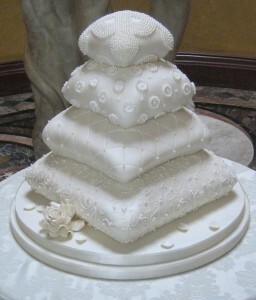 and the top “cushion” tier was created to look like the pillow that held the wedding rings. Can you imagine how beautiful this wedding must have been? This cake is truly too gorgeous to eat – but I’m sure the guests enjoyed it nonetheless. I love the intricate details on each of the cushion tiers – it’s so amazing the attention to detail. Many thanks to Hockleys Cakes for sharing this design with us.